Alta is for skiers. Alta is known for its light, dry and deep snow; for its thrilling alpine terrain; for its brilliant natural tree skiing; for its comfortable weather; and for an authentic mountain feeling that begins and ends with the skiing itself. All of it makes Alta the center of the known world of powder skiing. Alta is for all skiers, from beginner to expert. The natural rolling terrain of Albion Basin, combined with Alta’s dry snow and lovely weather, make a perfect setting for newer skiers to learn and improve. For intermediate skiers, Sugarloaf and Supreme are powder playgrounds. For experts, Alta means High Rustler, Eagle’s Nest, Gunsight and Baldy Chutes. Alta continues its tradition of skiing only, with no lift-served snowboarding. 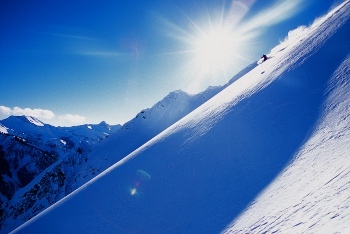 Snowbird Ski Resort, which has ridgeline connections to Alta and a resort base one mile away, offers 2500 acres of ski and snowboard terrain. With an Alta-Snowbird lift pass, skiers may ski from Alta to Snowbird and back, weather permitting.